Upon entering the exhibition space the sculpture Pipe Smoker greets you. This is quickly followed by the obligatory vinyl text blurb on the white wall situated next to a line of exhibition posters which allow an insight into the breadth of McLean’s practice. Explored across numerous works in the exhibition is a relationship between materials in works such as Spear Head (1983), where the ephemerality of the charcoal lines are captured on a painted surface in an almost awkward combination of forms and materials. Meandering round the exhibition are multiple monochrome images, say hello to a conceptualists dream. 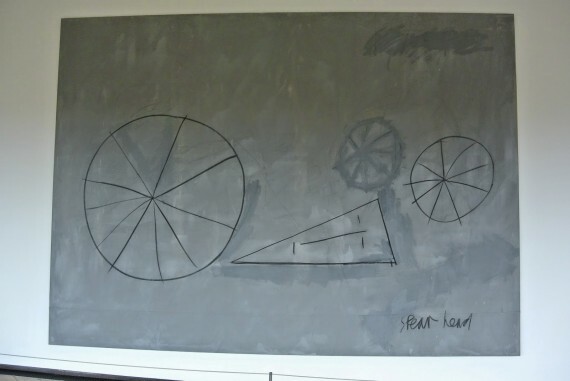 Yet McLean distanced himself from Conceptualism (or should that be conceptualism, I’ll leave out the capital c debate for now) in order to use humour to confront wider social and political issues of the 70s. 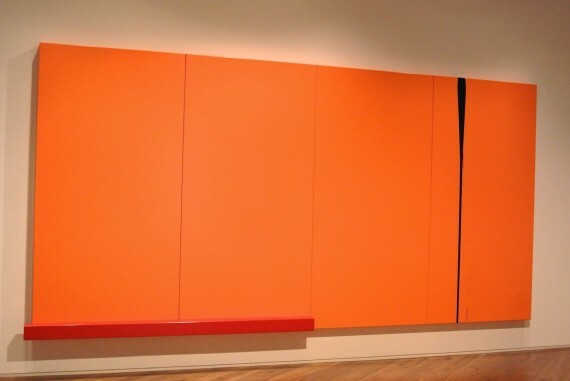 Situated in one of the gallery spaces is Jaffa, Jaffa, Jaffa (1991)- simply the most orange object in Essex at the moment. The bold pigment gleans off the framed prints documenting McLean’s early work hung around the room. Dazed by the orange the prints protected by museum standard frames highlight McLean’s earliest and arguably most interesting works. 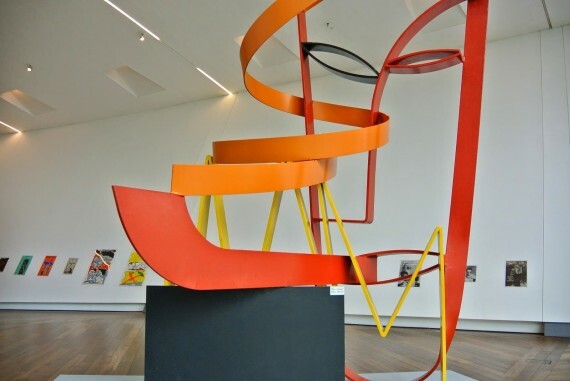 A dynamism and energy is extrapolated by sculptures mediated by photography and linked to performance to embody “action sculpture” as McLean put it. 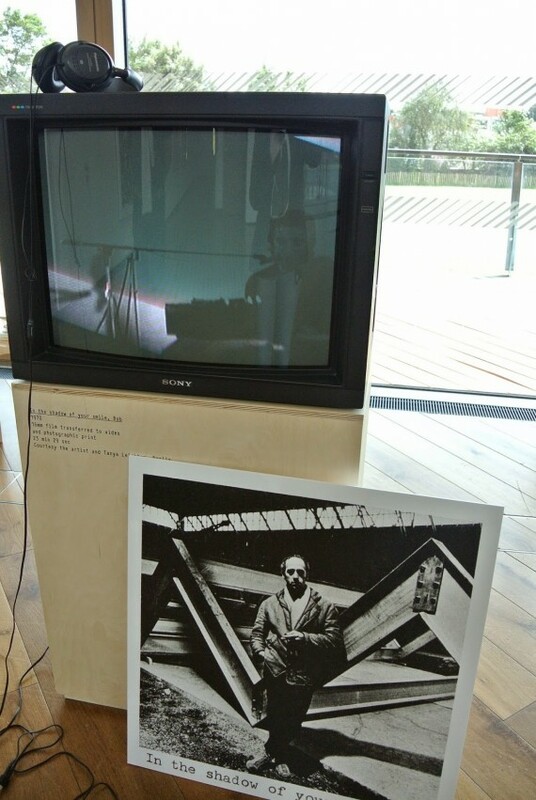 In the shadow of your smile, Bob (1970) – is one of several of McLean’s films being shown at the exhibition on a beautiful CRT monitor plonked on a plywood plinth. What is the allure that CRT monitors have over curators wishing to show black and white videos and films from the 60s? YouTubing the video on an iPad (or other Apple product most Conceptual art aficionados are bound to possess/ that a hipster may have in their satchel) aesthetically speaking it isn’t the same. However after making the trip to the gallery space after a delayed train (surprise), a YouTube clip has got nothing on some chunky funky overhead headphones that play the muffled sound of a film transposed onto a modern file format. 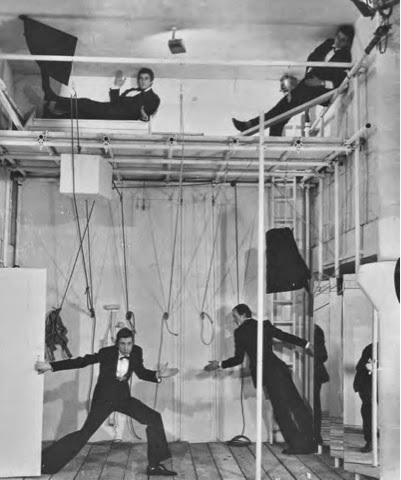 Sculptures/performances such as Nice Style High up on a Baroque Palazzo (1974) are re-described into live events and happenings now happening as static forms restrained and edited by the artist to transpose three dimensions into two. Viewing Nice Style, you don’t need to be an art historian to detect that this piece is from the 70s, hint – check out the flares. By photographing the sculptures/performances McLean is able to edit and mediate the work to make it impossible for the audience to experience the work as a whole. These photo-sculptural opportunities come to dominate McLean’s work and act as an extension of lines and the movement of forms to create a non-verbal communication cemented in a spatial awareness with a social positioning to explore the condition of sculpture. Enclosed in and protected by Perpex and plywood are some of McLean’s collaborative publishing efforts with Mel Gooding to form the Knife Edge Press. The containers the books sit in seem overly powerful plinths not enclosing the pieces but trapping them, friezing the books on certain pages and controlling the power of the reader. All in all the entire exhibition is an interesting snapshot into McLean’s prolific career, the exhibition has literally taken over the whole building (although maybe the gallery staff should wear flares like McLean in Nice Style – just a thought). See below for some more photographs documenting the exhibition which runs until the 21st September, 2014. Emily Godden’s practice is currently focused around printmaking stretched into its broadest sense of existence to explore, document and translate both physically and naturally occurring traces through the medium of print. 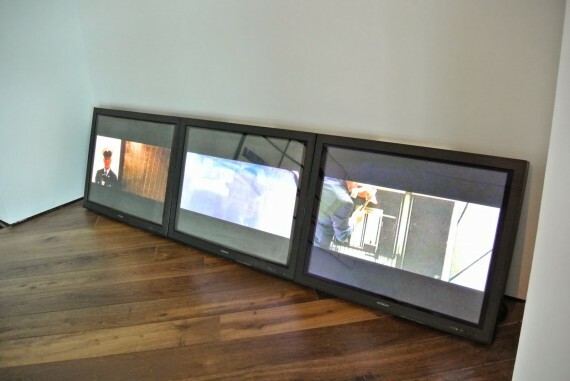 In recent work she has used sound as a mechanism to transmit data and communicate traces to exploit the essence of print in a post-digital landscape. Living in Ipswich Emily Godden is currently studying BA (Hons) Fine Art at UCS and has exhibited work at Tate Britain, Spike Island, Firstsite, The Sainsbury Centre for Visual Arts and was recently shortlisted for the Batsford Prize for Fine Art.